I recall being quite impresed that my father bought the Vida Blue pitchback for the backyard rather than the inferior non-celebrity endorsed version. It did not include a package of cocaine, however. 2. 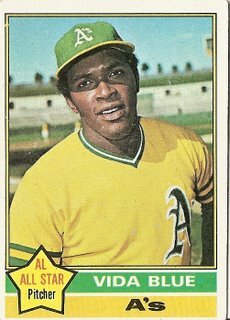 Being a native A’s fan, I recognize the background in Vida Blue’s card as the old, pre-“renovation” Oakland Coliseum, and, curiosly, it’s the same backdrop for your next two cards as well, Ed Brinkman and Jim Bibby. In fact, you can just make out some gold topped A’s players taking fielding practice behind Ed Brinkman, and possibly one by the outfield fence behind Bibby. I can only guess that Topps had a photographer living in the Bay Area and he probably took the opportunity to collect some shots during other team’s visits there.